And the bribe wasn’t all that big. This is why I did not pay the bribe, nor did I instruct anyone to pay the bribe or do anything to encourage payment of a bribe. Rather, I deduced that a certain extra payment (made in my absence by an Indonesian chauffeur) was probably a bribe, given that it was in addition to the actual fee for the services rendered — and there was no receipt. But what am I talking about? I am talking about the experience of getting an exit/re-entry permit. This is a document that KITAS visa holders (me) must acquire if they would like to leave Indonesia and come back. It might exist to extract money from foreigners, or because record-keeping is bad, or because the country has a tradition of requiring people to let the government know about their movements, or to prevent foreign workers from bailing on their employers. 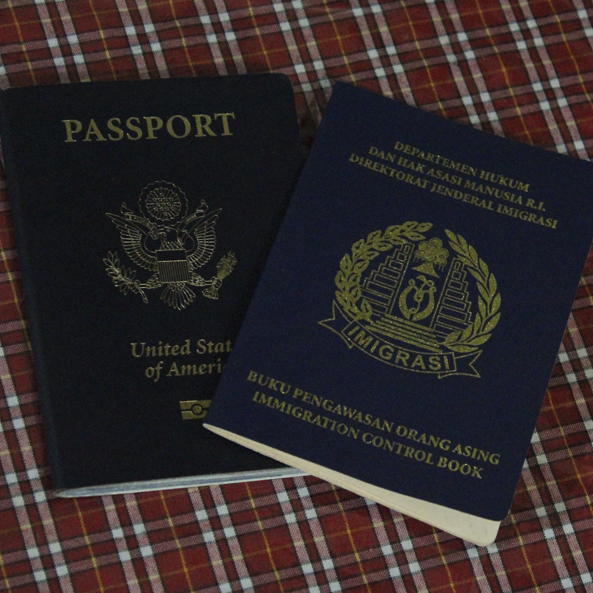 On a Wednesday, about two weeks before I was to take the GRE in Malaysia, I paid a visit to the immigration office together with the necessary documents for an exit permit. They gave me an application and asked for some photocopies, which I had done at a kiosk in front of the office. First, though, I had to fight through a scrum of ibus (women, generally older, very short and very good with their elbows) to get to the kiosk window. They don’t really queue here. At the immigration window, the officers seemed concerned. At which point I showed them the letter. He showed me a letter and I pointed to the list of requirements to note that this was not required. He didn’t care, but he was generous enough to provide a template. I returned a few hours later with the letter signed and stamped by the headmaster. This time Mr. K., my “friend” at the office, was out. For the next three hours. For prayers. The other dudes didn’t especially want to take my documents. Actually, they refused to look at my application. At least K. had glanced at it. Good on him. The highlight of the next few visits actually happened at school. Having been asked repeatedly at the office why no one from Panca Budi had come with me (a clue — maybe this was the problem?) and realizing that the office would close for the next two days in about an hour, I returned to school and asked for help. First, the driver. He was on board. Then I went to one of the two administration offices (that there are two is its own bizarre story) and asked for help. The deputy inspector asked something like, “Why does this have to be done today?” And then informed me (he is, after all, deeply knowledgeable about the Indonesian immigration process, having spent all of his life in North Sumatra) that I could do it the next day. At this point, he cringed, shrinking away from me and raising his shoulder to cover a face that seemed ready to fill with tears. “I don’t want to,” he whimpered, and a small but real whine passed from his lips as he turned his back on me and walked away. As has happened with almost everything, the day was saved by the school’s marketing guy, a former McDonald’s accountant and all-around good guy named Hendra, who watched the whole exchange and agreed to go with me. When I returned to the immigration office for the third time that day, I had my Jakarta support team on the phone. If the immigration officers caused trouble, I was to hand them the phone and force them to talk with someone who could explain to them what’s what. The school driver and marketing guy took point, and walked right into the back room where my friend at immigration worked. They moved to an adjacent conference room with a wide window, and began having an intense conversation. I narrated the gestures to the Jakarta team and was pleasantly surprised when Migra Man came out from the conference room eager to take my application. The problem, the school accountant explained, was that when I showed up alone, the immigration office decided I was attempting to flee the country. The purpose of the exit permit is to ensure that foreign workers stay in the country for the duration of their contracts. When I showed up alone, it looked like I was entering the immigration process behind my school’s back. Or it would look like that, except that a) my application was for exit and re-entry (which costs three times as much as a single or permanent exit permit) and I explicitly wrote the date of my return and b) it is totally legal for a resident alien to acquire an exit permit on his or her own initiative. But the immigration officers didn’t look at the application, which means they didn’t know that I wanted a re-entry permit. Instead, they thought I was asking for a permanent exit document (which of necessity terminates one’s employment contract) because, well, because they decided that’s what I wanted. The process wasn’t over, though, because I had to return two days later to pay (and get a receipt). Then I had to come back again to pick up the actual document. When I showed up to do that, they told me the school’s driver had already picked it up. He had picked it up, and paid an additional 150,000 rupiah (about $16) to… someone. No receipt for that one. I just now wished to thank you a whole lot just as before. Im not certain what I would’ve managed without the sort of advice shared by you close to this issue. It was an absolute difficult situation in my perspective, nevertheless having the capacity to view this professional technique you solved which forced me for you to cry with happiness. I am delighted for this assistance and thus trust you will know what a powerful job you are undertaking educating others all through your web site. Im certain you’ve by no means met everyone of us.